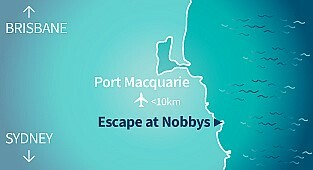 Escape at Nobbys is located at 74 Pacific Drive, Port Macquarie - midway between Sydney and Brisbane on the North Coast of NSW. Across the road from Escape at Nobbys you will find beautiful Nobbys Beach, framed by the very popular Flynns Beach and stunning Shelly Beach. In fact, Port Macquarie holiday makers have a choice of 18 beaches, of which 6 are lifeguard patrolled and nearly all are suitable for swimming and surfing. Flynns Beach shops and restaurants are located just 500 m along Pacific Drive and the CBD is within 4 km. CSIRO once said we enjoy the best climate in Australia, with the average temperature ranging from 7°C to 27°C. Escape at Nobbys is only 4 hours drive from Sydney and a one hour flight from Brisbane or Sydney with Virgin or Qantaslink.